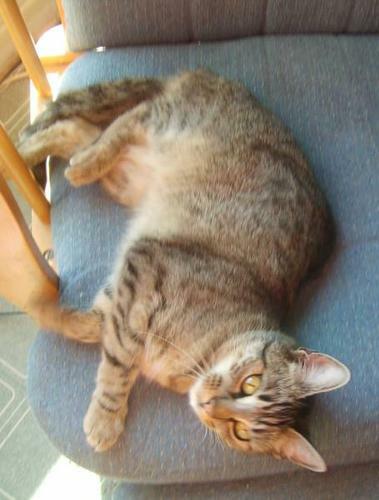 Female tabby cat looking for a good home. 'Mia' will be 2 years old in December. She is very active and loves to play. She would make a great companion for the person or family who can give her the care and attention she needs. We are looking for a new home for her because a new baby in the home is enough work without having to chase Mia away from the baby's things and other places she is not supposed to be! She is not spayed and is an indoor cat.